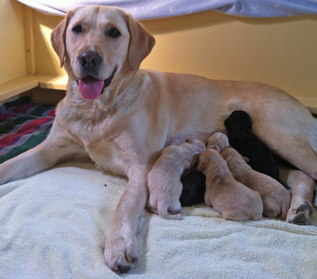 BC Guide & Alberta Guide Dogs maintains an in-house breeding program. The role of the breeding program is to provide a regular supply of suitable adult dogs for our training programs. We breed Labrador Retrievers, Golden Retrievers and a first cross of the Labrador & Golden Retriever. These dogs are exceptionally affable, gentle, intelligent, energetic and good natured – making them excellent companions and working dogs. We participate at an international level with many other guide dog organizations in the sharing of puppies and breeding materials in order to produce puppies bred specifically for traits required in our working dogs. On occasion we are looking for families to become breeder-caretakers for both male and females that have been chosen for our breeding program. In this volunteer situation, the primary caregiver must be at home to care for the dog. All expenses are covered by BC & Alberta Guide Dogs, but you must be available to transport the dog where needed if a breeding is required. As well as families to care for the females between litters, we look for families to have a female join their family and then to birth and raise the pups to the age of 7-8 weeks. This is supervised and supported but is a 24/7 project. The joy of raising pups from birth can only be felt by experiencing the entire process. For more information contact Linda Thornton at linda.thornton@bcguidedog.com or 604-940-4504.